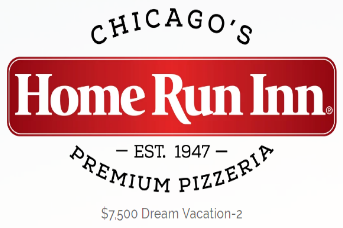 Home Run Inn Savor Each Moment Sweepstakes – Win $7,500! ENTER SWEEPSTAKES HERE – Home Run Inn Sweepstakes page. ENTRY LIMIT – You may enter the Sweepstakes only one (1) time per day through either the Entry Code Entry or the Alternative Method Entry. You may only enter the Sweepstakes with one e-mail address. ELIGIBILITY – To be eligible for the Sweepstakes you must be an individual who, at the time of entry into the Sweepstakes, (a) is a legal resident of one of the fifty (50) United States (including the District of Columbia) excluding the State of New York and the State of Rhode Island, (b) is at least the age of majority in your state of residency, (c) is physically located in one of the fifty (50) United States excluding the State of New York and the State of Rhode Island, and (d) has access to the internet and a valid e-mail address. SWEEPSTAKES ENTRY PERIOD – The Sweepstakes begins at 12:01 a.m. Central Time on December 15, 2017 and ends at 11:59 p.m. Central Time on March 30, 2018. PRIZES – One (1) prize will be awarded in the Sweepstakes. The prize will be $7,500 (awarded in the form of a check payable to the winner from the Sponsor).